Banana trees are one of the common trees that come to mind when dreaming of the tropics, but did you know that it is not really a tree? It is actually the world's largest herb. The trunk is composed of the main fruiting stem enrobed by leaves. Still, due to its size, it is commonly thought of as a tree. No matter the size of your yard, there is a banana tree to fit it. While most species grow best in the warmer climates, there are cold-hardy banana trees. They make good houseplants with enough light and water. While the fruit of many species is full of seeds and possibly inedible, cultivars have been created over time that eliminated the large seeds and made the fruit palatable. Mature Size: Wide range of sizes: "Truly Tiny" cultivar is only about 1.5 feet tall, while "Cuban Red" can be up to 25 feet tall. Soil Type: Rich, well-drained soil. Salt is not tolerated. Hardiness Zones: Many cultivars grow best in Zones 9 through 10. One species, Musa basjoo, may survive outside as low as Zone 5 if mulched well. Other zones will find that the smaller cultivars make great houseplants. Grow this plant in a location where it will be sheltered from the wind as it is very susceptible to damaged leaves. Banana plant leaves are huge—depending on the variety, they can be up to 2 feet wide and 9 feet long. Banana plants have a generally irregular shape. Bananas form in late summer in a cluster called a hand. Not all forms are edible; some may be tasty but have large seeds. They start finally ripening the following March. When the fruit is green but plumped up, cut off the stalk and place in a cool, dry space. Stalks can range in sizes from 2.5 feet to 12 feet long. The colors can be yellow, pink, green, or red. The most common type that produces edible fruit is the Cavendish variety. Most types of bananas plants prefer full sun. Some variegated varieties can scorch easily and will do better in partial shade. The soil should be well-drained, deep, and organically amended. Slightly acidic soil (5.5 to 6.5 pH) is preferred. Since banana trees are tropical and hail from rain forests, they need a lot of water and plenty of moisture in the air. They do best when planted in groups rather than as single specimens. Being close together helps them retain moisture in the leaves. Provide 1 or 2 inches of water weekly and check frequently to make certain the soil stays evenly moist. Make sure they are not over-watered so you do not get root rot. The soil should be moist but not soggy at all times, if possible. Bananas thrive in warm, humid conditions, but protect plants against temperature extremes as much as possible. Even very hardy, cold tolerant banana plants like consistent temperatures ranging between 75 and 95 degrees Fahrenheit. When temperatures drop, growth slows down, and very cold temperatures cause plants to die back. To guard against temperature extremes, plant in sheltered locations. Provide more protection by bringing your plants indoors or winterize your plant when cold weather hits. "Spread the fertilizer evenly around the plant in a circle extending 4 to 8 feet from the trunk. Do not allow the fertilizer to come in contact with the trunk. Feed container plants on the same monthly schedule using about half the rate for outside plants." These heavy feeders need ample amounts of organic matter such as green sand. Pay close attention to potassium levels. Potassium is an extremely important element, as bananas are filled with potassium, so this is a very necessary nutrient for the plant. These plants are monoecious—meaning the plant has both the male and female reproductive organs in the same individual plant. There also may be neutered flowers. Bananas are classified as a berry, and the fruit actually comes from the female flowers, which, strangely enough, develop without pollination. The seeds of bananas are not fertile. The best propagation is through division. To divide banana plants, separate the suckers or pups from the rhizome using a very sharp spade and quite a bit of strength. Before you do this, wait until the pups (or suckers) are at least 3 feet tall and have their own roots. Make sure there are several pups before you take any suckers off, so it does not unbalance the original plant. When dividing, make sure the suckers have plenty of roots to get a good start when replanted. Once you separate the sucker from the parent mother plant, allow the surface of the rhizome section to dry for a day or so. At this point, it will be ready for replanting in any desired location. 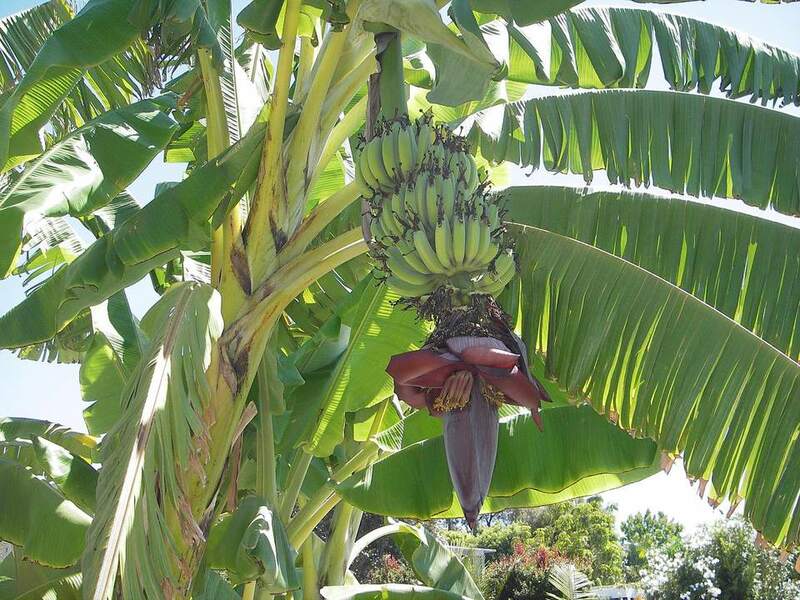 Banana trees will grow in containers but need at least 15-gallon pots as the minimum size for optimum growth. When it is in a container, you can have complete control over the plant’s environment. You should be able to protect it better in cold and inclement weather. Repot and divide container grown banana plants at least once every three years. Use a very high quality of potting mix and make sure to fertilize regularly. Before the banana tree fruits, prune it so there is only one main stem. After it has been growing for 6 to 8 months, leave one sucker. This will replace the main stem in the next growing season. After the fruit is removed, cut the main stem down to 2.5 feet. Remove the rest of the stem in a few weeks, leaving the replacement sucker intact.